By LPDAdmin in Articles, Ghosts, Paranormal, Supernatural on October 15, 2012 . Johnstown, PA is a little industrial town in Cambria County. I lived in this community for 4 years while I was in college. 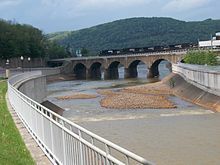 Johnstown is known for it’s steel production, the fact that the movie “Slapshot” was filmed there, and it’s great floods. The worst flood occured May 31st, 1889. Some of the remanents of the flood are still in Johnstown. There is a church in downtown, right on the square, that withstood the force of the wave and has a plaque on the wall marking the location of the water line. I kid you not when I say that this if about 30 feet up the building.. I have visited the site where the dam was, seen what is left of the dam, and even watched the movie that was put together at the museum. But nothing has creeped me out as much as the bridge. Even before I knew the history of the bridge, it disturbed me, every time I drove by it, it sent chills down my spine. I thought that it was just because it was an old bridge. Here is a picture of the present day bridge….. It was this bridge that created a temporary dam that held the massive wall of water. There was so much debris in the water from the 1600 homes that were destroyed along with the 280 businesses that were lost, it all became trapped in this bridge. Many people who could have survived the watery ride, were trapped at this bridge. The pool turned into a massive whirlpool and the debris caught fire, making a bad situation even worse. This bridge still stands today and is a very eerie place to visit. If you ever get a chance, visit Johnstown, a very haunted place indeed. 2209 people died in the flood of 1889 and there is a lot of history about it. The cemetary where the 777 unidentified victims were buried….Grandview Cemetary…..here is an old picture of the cemetary. I have visited this place and it has a very depressing atmosphere. You can read a thorough history on the flood, just do a search on the internet and tons of stuff will pop up.